With the introduction of the improved Image Trace function in Adobe Illustrator CS6 and later upgrades, a whole world of possibility opened up to users of graphics software who want the ability to trace line art and photos and turn them into vector images. Now users can turn bitmap to vectors and PNG files into SVG files using Illustrator with relative ease. 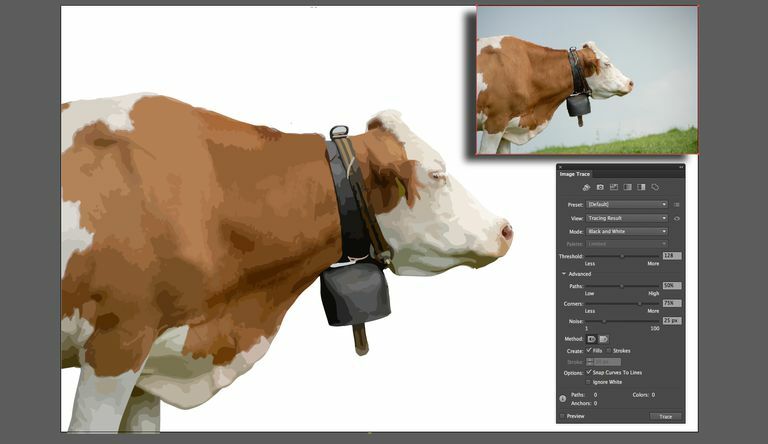 This process works best with an image with a subject that stands out clearly against its background, such as the cow in the image above. To add an image to trace, select File > Place and locate the image to be added to the document. When you see the Place Gun, click the mouse and the image drops into place. To start the tracing process, click once on the image to select it. When converting an image to vectors, the areas of contiguous colors are converted to shapes. The more shapes and vector points, such as in the village image above, the larger the file size and the greater CPU resources required as the computer works to map all of those shapes, points, and colors to the screen. With the image in place, the most obvious starting point is the Image Trace dropdown in the Illustrator Control Panel. There are a lot of choices that are aimed at specific tasks; you may wish to try each one to see the result. You can always return to your starting point by pressing Control-Z (PC) or Command-Z (Mac) or, if you really messed up, by selecting File > Revert. When you choose a Trace method, you will see a progress bar showing you what is going on. When it finishes, the image is converted to a series of vector paths. If you select the tracing result with either the Selection Tool or the Direct Selection Tool, the entire image is selected. To see the paths themselves, click the Expand button in the Control Panel. The tracing object is converted to a series of paths. In the case of the above image, we can select the sky and grass areas and delete them. To further simplify the image, we can select Object > Path > Simplify and use the sliders in the Simplify panel to reduce the number of points and curves in the traced image. Another way of tracing an image appears in the Object menu. When you select Object > Image Trace, you have two options: Make and Make and Expand. The second choice traces and then shows you the paths. Unless you are tracing a pencil or ink sketch or line art with a solid color, the result is usually black and white. 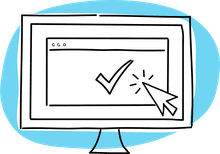 If you are looking for more control in tracing, open the Image Trace panel found at Window > Image Trace. The icons along the top, from left to right, preset for Auto Color, High Color, Grayscale, Black and White, and Outline. The icons are interesting, but the real power is found in the Preset menu. This contains all of the choices in the Control Panel, plus you get to choose your color mode and the palette to be used. The Colors slider is a bit odd; it measures using percentages but the range runs from Less to More. You can modify the tracing result in the Advanced options. Remember, the image is converted to colored shapes, and the Paths, Corners, and Noise sliders allow you to modify the complexity of the shapes. As you fiddle with the sliders and colors, you will see the values for the Paths, Anchors, and Colors at the bottom of the panel increase or decrease. Finally, the Method area really has nothing to do with corners. It has everything to do with how the paths are created. You get two choices: The first is Abutting, which means the paths all bump into each other. The other is Overlapping, which means the paths are laid over each other. With the trace completed, you may want to remove portions of it. In this example, we wanted just the cow without the sky or the grass. To edit any traced object, click the Expand button in the Control Panel. This will turn the image into a series of editable paths. Switch to the Direct Selection tool and click on the paths to be edited.